All About Argentium - Better Than Sterling! Treat Your Art Like Work — In a Good Way! Art is work. If you’ve ever doubted that, take a look at the output from masters like Georgia O’Keefe, Andy Warhol, the Davids (Byrne and Bowie), Vincent Van Gogh, or Frida Kahlo. What did they all have in common? The worked really hard, each creating thousands of paintings, sketches, songs, photographs, prints, or recordings. Look at the master, Pablo Picasso, who created an estimated 50,000 pieces of art: 1,885 paintings; 1,228 sculptures; 2,880 ceramics, roughly 12,000 ceramics, roughly 12,000 drawings, many thousands of prints, and numerous tapestries and rugs. And they had to impose on themselves a discipline that lots of folks get from having a “real” job. Ha! Making art is a real job! Even if lots of us don’t make a living at it. As I said in a recent post, wire weaving is time-consuming, no doubt! It’s really challenging to find time. In my case, I work as a self-employed bookkeeper, and perform most weekend nights in the band I run with my husband, Jim. That means time is at a premium. So, it’s incredibly important that I be disciplined with my time to make sure that my jewelry making gets equal time. It’s equally important to me. Respecting your time also means respecting your work. If it’s worth doing, it’s worth doing well. And even if I’m not happy with an individual piece, it doesn’t mean that piece is no good. Block off time for art — I make sure that I block off time every day for jewelry making. Most days, it’s early in the morning, usually starting between 5 and 5:30 a.m. (I know: I’m an early riser!) It doesn’t matter really when you block the time off, as long as you make sure you DO block it off. Have a space for art — I don’t have a studio, per se. But I have a space in our house dedicated to my art. It’s a place where I can spread out my tools and materials, work in peace, and soak in the inspiration being surrounded by the tools of my trade. Respect your time; know when to stop — I set a timer (Thanks Alexa!) to remind me to stop weaving and get to “work.” I bet I’m not alone in that I get caught up in the creative process and lose track of time. Don’t assume everyone shares your preferences — I once finished a piece that I frankly wasn’t crazy about. It was perfectly OK, but just didn’t thrill me. I sold it a week later to a client who loved it. And it looked beautiful on her. That was a powerful lesson for me. Just because I’m not thrilled with a piece doesn’t mean someone won’t love it. We once got the chance to attend a songwriting workshop with the famous singer/songwriter Tom Rush. Tom is a true artist, and approaches his craft with appropriate seriousness. Among his advice: Never throw your work away. He’s got a file cabinet full of scraps of paper with lyrics, melodies and simple ideas, stashed away in folders, collected over many years. Sometimes, he said, he’ll pull out a napkin or receipt with a line or two written years before that leads to a new song. That’s inspired me to keep all my work – no matter how underwhelming — to me. Sometimes I’ll revisit a piece that I wasn’t crazy about, and that becomes the starting point for a “makeover.” I might change the chain, or the bezel or a bail. I might swap out the sea glass. Maybe add a vintage bead I’ve recycled. It’s all part of the process. One of the best parts of what I do is meeting people at shows and crafts fairs. Because I bring a mini-version of my studio with me, I'm able to work on pieces of jewelry between customers. And I get a lot of questions! Here are some of the most frequently asked questions, and my answers. Wire weaving is time-consuming, no doubt! It takes me about 4-8 hours to make a typical piece — some longer, some shorter. I make everything by hand - the settings, chains, chokers, clasps etc. Do you draw out your designs first? The answer is no. Sometimes I'll start a piece with "no direction home," as Bob Dylan says. I follow my instinct, and my brain as I weave. Sometimes, a particular piece of sea glass or pottery will spark an idea for a design in my head. But that's just a starting point. Once I start weaving, who knows where I'll end up! So, each piece is unique. The sea glass and beach pottery are the starting points. 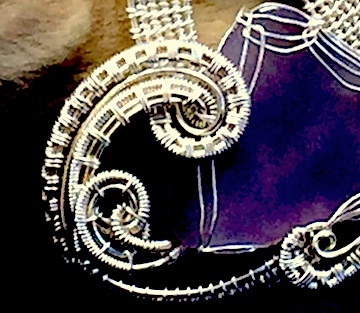 The weaving is all done with tarnish-resistant brass or silver-plated wire in various gauges. I do use bronze and copper wire from time to time, but they present certain challenges (copper oxidizes, for example) so I don't use them as often. I've started weaving leather cord for a lot of my pieces as well for a more casual look. How are the pieces held together? Everything is held in place by the wire weaving. I don't use any glue or solder. I don't drill holes in the glass and pottery for chains or chokers. It's just the way my art has evolved, and the way I prefer to create! Do you use a rock tumbler? I get this question from time to time. A tumbler is a machine that spins and shakes stones, glass or pottery in a mixture of water and sand, small stones, or some other abrasive material to smooth and polish the object. It takes days or weeks of constantly running, and is widely used by folks who work with gemstones. I've used a tumbler on extremely rare occasions. In fact, there's only one piece in my current collection that includes a tumbled piece of red glass. And I'll always indicate if a piece includes an object that's been tumbled. The vast majority — all but the one mentioned — represent the glass or ceramic just as Mother Nature intended. Ha! People always ask, and I am always coy about this. The truth is, sea glass can be found on almost any beach! Yes, there are some places richer than others. You can search on line. That's how I learned about the beach in California where once stood a famous hotel. We almost had to buy an extra suitcase to get home! But let's face it: humans are litterbugs, and we've been dumping our trash into the sea for thousands of years. There's no shortage of sea glass. Unless you're talking about red sea glass. In other words, I'm not going to tell you where I find my sea glass, except to say "Everywhere I look." It's easy to think of the beach as a sunny summer spot. But for me, winter and spring mean lots of time for collecting the raw material that will inspire my next jewelry pieces. The beaches are less crowded; the tides and weather more extreme; and often, the sea glass and pottery that I use are more plentiful in the winter and spring. Yes, the winters here can be brutal. But they also bring unexpected treasures: rare birds, beautiful snowscapes and yes, a gold mine of sea glass and pottery on our beaches. One of my favorite things to do is walk on the beach after a powerful Nor'Easter. The sands have shifted, and the ocean has coughed up trash and treasure alike. The day after a storm is often still rough and windy. But it's worth it. I've discovered some of my most fun, beautiful and favorite pieces in the immediate aftermath of a bad storm. As I fill my bags with future pieces of jewelry, I get excited about the season ahead. I hope to be at several crafts shows and fairs around New England this spring and summer. Applications are in, the juries are convened, and I'm hoping for the best! As the calendar comes together, I'll publish dates and locations on the Upcoming Shows page. Meanwhile, I'm working on new pieces all the time. I'm constantly experimenting with new weaves, different ways to set the sea glass and pottery and unique chains, chokers and bails. I never know what the end result will be - and I'll have more to say about that in another blog post. So, even as we hunker down to ride out the latest version of nature's idea of a good day, keep in mind that tomorrow will be better, and filled with glass and ceramic reminders of the power of the ocean. The ocean can tear down, reshape, and renew everything. It inspires me to do the same with her beautiful trinkets.